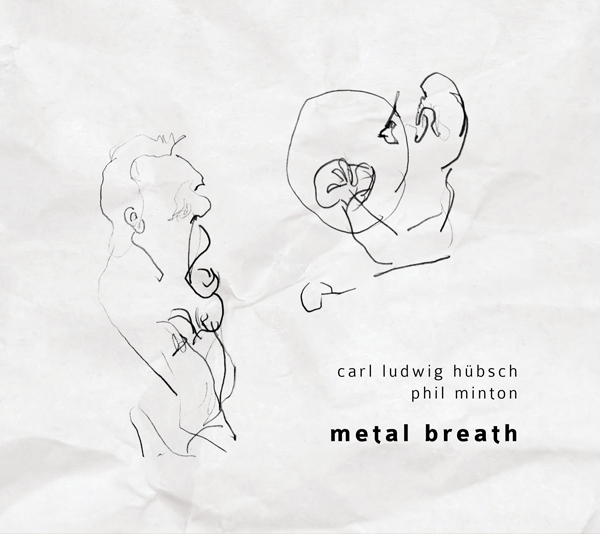 With Metal Breath, we’re back to something more intimate and close-up, all-acoustic, and produced by the continual tuba puffings of Hübsch and the unearthly voice wailings of Minton, the English veteran / maverick who remains impossible to fit within any musical genre in a tidy fashion. We’ve mostly heard Hübsch in a trio with Pierre-Yves Martel and Philip Zoubek, for years a shining example of extended techniques and constrained, minimal music generation. Minton has recently yawped with Joëlle Léandre playing her contrabasse at his elbow on a Fou Records release; perhaps his work is best showcased in these small duo settings, one instrument + one voice for best effect. This release contains two very long pieces, ‘Copper’ at 24 mins and ‘Zinc and Blood’ at nearly 33 mins. Those titles are pretty “elemental” for sure. They make me think of the human system and whatever medical supplements I might need, such as a copper bracelet or zinc tablets, to supplement my diet and keep the ravages of senility at bay. The short three-minute piece ‘Flesh’ which completes the disc may confirm my theory that the subtext or theme is simply the frailty of the human anatomy, so Metal Breath is more than just a description of the players and their respective skillsets. Lastly, I also like Ingrid Hoberg’s photo inside this release – tilted horizon, primitive drawing on a poster on the wall behind the duo – but mostly for the image of Minton crammed into the right-hand side of the image such that we really only see his torso and head. His head is tilted back and his face looks like an agonised turtle dreaming of being an eagle. From 8th May 2018.